This collection contains five pre-war and post-war photos of several members of the Feldberg family. Johan Feldberg was born in Kostiantyniv Staryi, Ukraine, on 28 March 1872. He became a fabric dealer and married Elza König, born in Sambor, Russia, in 1868. 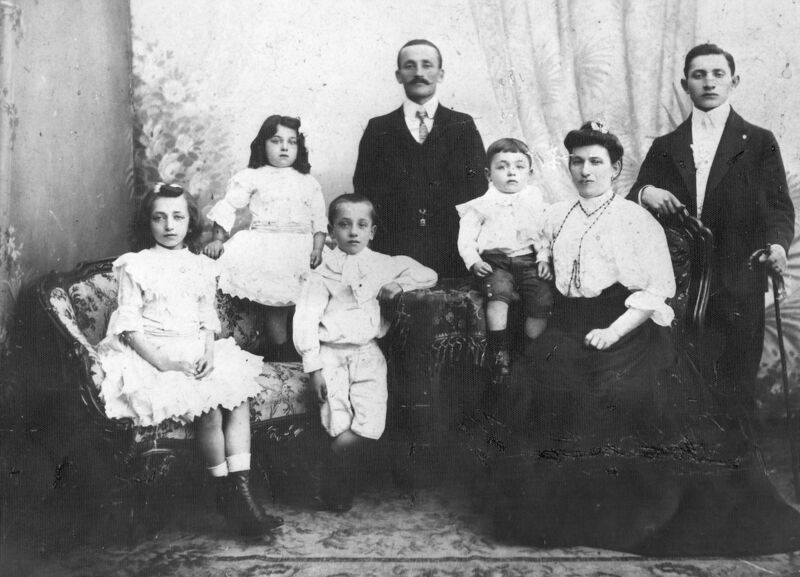 The couple had two children before they emigrated from Russia to Ostend, Belgium, in 1901 : Ida (b. 1894) and Abraham (b. 23/09/1897). In Ostend, three more children were born : Eva (b. 09/01/1901), Jules (b. 26/07/1903) and Augusta (b. 08/08/1908). During World War I, Johan Feldberg fled with his family to the United Kingdom, before returning to Belgium in May 1919. During World War II, oldest daughter Ida Feldberg lived in Marseille, France, where she survived hostilities. Brothers Abraham and Jules Feldberg remained in Belgium, but were protected against deportation thanks to their marriage to a non-Jewish, Belgian women. However, father Johan Feldberg, whose wife Elza König had passed away in 1931, was arrested during the only big anti-Jewish raid in Brussels in the night of 3 on 4 September 1942. He did not survive deportation from the Dossin barracks via Transport VIII on 8 September 1942. It is likely that, since he was 70 years old at the time, he was sent to the gas chamber upon arrival on 10 September 1942. Middle daughter Eva Feldberg, wife of Icek Glogowski, and her three children, Elka Tauba (9 years old), Simon (7 years old) and Leon (5 years old) were arrested on 30 September 1942. All of them were deported from the Dossin barracks via Transport XII on 10 October 1942. Since the children were so young, it is likely that the complete family was sent to the gas chamber upon arrival. Eva’s husband Icek Glogowski was not deported, but disappeared during the war. His fate remains unknown. Augusta Feldberg was arrested in Gent on 17 November 1943 and was interned at the local prison before her transfer to the Dossin barracks on 1st December 1943. Augusta was deported via Transport XXIII on 15 January 1944. Upon arrival at Auschwitz-Birkenau, she was selected to perform forced labour. The number 74530 was tattooed on her left forearm. Augusta survived forced labour and a transfer to Ravensbrück in 1944 or 1945. She was liberated by the American army at Malchow on 8 May 1945 and was repatriated to Belgium on 20 May 1945. Augusta Feldberg was reunited with her sister Ida and her brothers Abraham and Jules. She had a son and a granddaughter. In 2012, Liesbeth Feldberg, granddaughter of Augusta Feldberg, donated digital copies of the few remaining Feldberg family photos to Kazerne Dossin.